How to do the Offline Activation in Crystal? Step 1: Choose "Offline" and "Activation" then select the path to store offline.req. Click "Export" to export it. 2. Copy the offline pack to a PC connect to the Internet and do the activation. Run "NUUO Offline License Tool". 3.When you open the offline tool, it will pop up a message "Can not load request file'. Please click "OK" to skip out it. 4. Input the "Offline.req" in Offline tool. 5. Input your Serial Number then click "Activate". Note: If you want to activate multiple licenses at the same time, you can input licenses number to a txt file as below. 6. 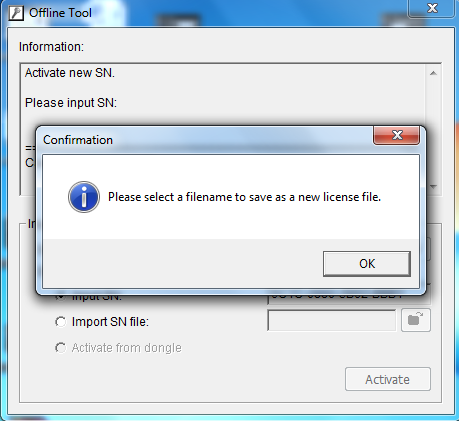 It will generate a "Offline_License.dll" file and please save it. 7. 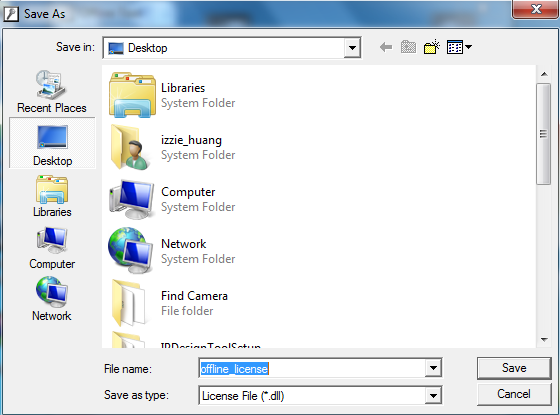 Choose where to save Offline_license.dll, for instance: Desktop. A warning message will pop up to remind you the notification of .req file. 8. Copy the "Offline_license.dll" file back to Crystal and import the file. 9. Then you can see your license will show on the License List. That means your license has been activated successfully. How to do the Offline Transfer in Crystal?